This IBM Redbooks publication describes the fundamental concepts and benefits of message queuing technology. This book is an update of a very popular Redpaper (REDP-0021) based on IBM WebSphere MQ Versions 5.0 to 5.2. This publication provides a design-level overview and technical introduction for the established and reliable WebSphere MQ product. A broad technical understanding of the WebSphere MQ product can improve design and implementation decisions for WebSphere MQ infrastructures and applications. 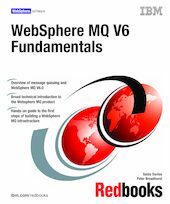 To reduce the time required to gain this understanding, this book summarizes relevant information from across the WebSphere MQ product documentation. We also include hands-on security and troubleshooting sections to aid understanding and provide a reference for common administrative actions performed when building and maintaining WebSphere MQ infrastructures. In the appendix, we provide a summary of the new features in WebSphere MQ Version 6.0.